Every so often, amid the hurly burly of politics, a moment comes when the terms of trade change. A moment when the facts alter, the arguments shift, and the debate moves on. Today was one of those days. The landscape is fundamentally transformed. 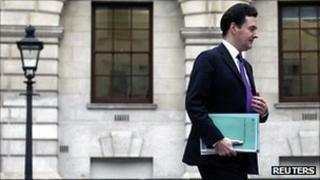 A government that promised to eliminate the budget deficit by the next election has admitted that it will fail. It now says it needs another two years to meet its deficit target. And what's more, to do that, it needs to inflict yet more pain - a squeeze on tax credits and further pay restraint for the public sector. There will be more spending cuts in the years after the election. And oh, yes, many more of us will have to wait longer for our state pension. So just as the facts have changed, so must the politics. The key test in the short term is how the electorate respond. They are governed by a coalition whose raison d'etre is economic competence, an administration elected to take tough action to fix the economy. George Osborne has now admitted that that task has got tougher. His argument - and one backed up by the Office for Budget Responsibility - is that growth has been - and is being - hit by rising international commodity prices, the eurozone crisis and by the discovery that the long term damage to the economy from financial crisis was worse than previously thought. Labour's argument is that the poor growth announced today is largely down to the government's spending cuts and tax rises, and that today's figures show that the government's "Plan A" is not working. Which argument the voters accept now will have a huge impact on the choices they make at the next general election. The key question from today is whether or not the chancellor's statement damages the government's reputation for economic competence in the eyes of voters and the markets. Today's poor economic news will transform the nature of the debate at the next general election in 2015. Until this morning, the assumption had been that the election would be about which party was best placed to use the proceeds of an incipient recovery. In other words, what taxes would they cut and what spending would they increase? That debate is now for the birds. Instead, the battle at the next election will be about which party can best complete the job of fixing the economy. Should voters keep hold of the devil they know, keep a hold of nurse for fear of finding something worse and trust the government to finish what it started? Or should voters conclude that more of the same is not enough, that it is time for a change with Labour? Much will depend on the economic forecasts at the time and how much today's growth stimulus has had any tangible impact. It is notable that Mr Osborne's right wing critics today compared his statement to Gordon Brown's budgets, accusing him of tinkering rather than transforming the prospects for growth. But note this. I referred to the government. It is actually a coalition. That coalition is now making predictions about what it should do after the next election. This prompts a huge number of questions. How much can a coalition administration make assumptions about its re-election? How do the Conservative and Liberal Democrats compete against each other if they are promising the same spending cuts? How much do they agree in a future spending review before the next election? Suddenly Tory and Lib Dem ministers are going to have to start making decisions that will test the coalition fabric anew. Millions of public sector workers are preparing to go on strike because they think the government is unfairly cutting their pensions. They are already unhappy because they are enduring a pay freeze. Today Mr Osborne told them to expect more years of pay restraint and variable local pay rates. I cannot think of anything that would stiffen the sinews of striking public sector workers more than this. It was notable that the chancellor chose to use his statement in the Commons to make the case, once again, for the government's pension reforms. He insisted the changes were fair, would make public pensions affordable to the taxpayer, and he said the strikes would damage the economy. But in the short term, the new pay restraint will provide ammunition to the unions. For the Liberal Democrats, there is much in this to shout about. They will claim that Nick Clegg has succeeded in his campaign to do more to increase social mobility. They will point to the help for young unemployed people and the extra free nursery places for disadvantaged families. Their problem will be how to explain away a squeeze on tax credits, something that hits the working poor. Many Tory ministers were very wary of doing this. Lib Dem ministers argue that the money is better spent on helping children in their early years rather than just handing out cash in tax credits. They also point to the protected inflation rise for those on out-of-work benefits. But the Lib Dems could take quite a lot of political heat for this. In this transformed landscape, the test for Labour is to ensure that it makes the most of the gloomy figures. For all Ed Miliband's arguments about the cost of government cuts and the shape of a new, responsible capitalism, the polls continue to show that he and Ed Balls struggle on measures of economic competence. They will want to make progress in trying to convince voters that they do have an alternative plan to stimulate growth. But at the next election, they will now have to do more than persuade the nation of their economic competence, they will also have to demonstrate how they intend to pursue social democracy with no cash in the bank. Labour governments have traditionally tried to promote equality by redistributing cash raised from economic growth. What now when the deficit is projected to last well into the next parliament? Of course, if the eurozone collapses, as some predict, then much of what George Osborne has announced today will become redundant. The OBR is so worried about this that it says it is impossible to quantify the risk in a meaningful way. But its language is apocalyptic. "The possibility of a more disorderly outcome represents a significant downside risk to our forecast," it says. "A more serious escalation of the crisis, such as a disorderly default on sovereign debt, could put the global financial system under severe strain leading to tighter credit conditions, further depressing world output and trade." As Mr Osborne himself admitted in the Commons: "If the rest of Europe heads into recession, it may prove hard to avoid one here in the UK." In other words, if the eurozone crisis worsens, all bets are off.